Stakeholders with their Paradise Beverages product. Tourism Fiji is proud to confirm Paradise Beverages as a Gold Sponsor for the Fijian Tourism Expo 2019. The expo is scheduled to from 22-24 May at the Denarau Convention Centre at the Sheraton Fiji. The region’s leading beverages company, Para­dise Beverages has signed on to be the official beer, spirits and alcohol sponsor for the event this year. Paradise Beverages general manager of market­ing and new product development, Rowena Taito said: “We have partnered with FTE from the begin­ning. 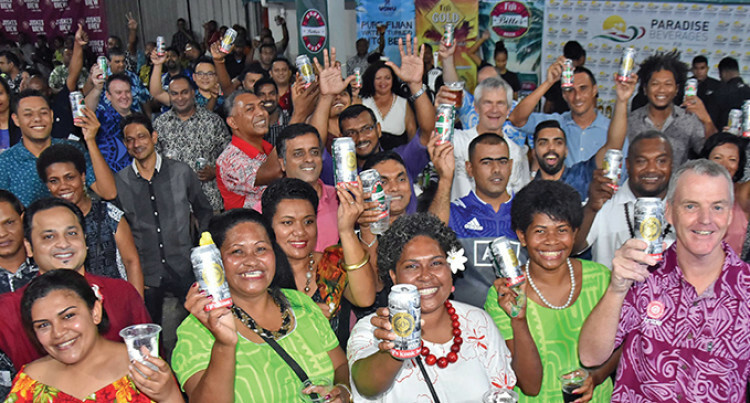 “Our partnership represents an exciting oppor­tunity for us to showcase our globally award-win­ning Rum Co of Fiji Bati and Ratu rums and world-class beers with people from across the world,” Ms Taito said. Ms Taito added: “The tourism market is just as important to Paradise Beverages as it is to our country. Ms Taito further states that as a leading employ­er, they are also proud of the important economic contribution they make to the region, contribut­ing around $100 million to Government revenue each year through taxes and duty. “Approximately one third of tourism spend is on food and beverages. “We want to ensure visitors to Fiji have the best experiences. “And we would like to wish Tourism Fiji and the event committee all the best with the 2019 FTE, and look forward to all it has to offer,” reiterated Ms Taito. Paradise Beverages also supports other major events, such as the annual Uprising Music Festi­val, that help bring people into the country. Tourism Fiji chief executive officer, Matthew Stoeckel said: “We value all our sponsors and would like to thank Paradise Beverages for extend­ing their partnership and working relationship with us this year. The expo will be held at the Sheraton Fiji Resort & Spa on Denarau Island.